The Inaugural WIE DREAM Conference a Success! Students, parents and teachers listen attentively to WIE DREAM Conference speakers. 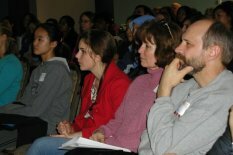 The Women in Engineering Program held its inaugural DREAM Conference (Developing Revolutionary Engineers and Mentors) on Saturday, February 16, 2008. Over 350 excited students, parents and teachers packed into the Adele H. Stamp Student Union to learn about opportunities in engineering at the University of Maryland. Participants engaged in activities including workshops, games, task tests and panels with faculty, current students and professional engineers. The A. James Clark School of Engineering was well represented with each department hosting workshops and tables at the information fair. Engineering student services and several engineering student organizations were also present at the information fair. The Breakfast Keynote speaker was Jenny Regan, CEO of Key Tech and member of the Clark School?s Women in Engineering Advisory Board. BAE Systems, Land and Armaments Division, a Terabyte sponsor for the conference provided the Luncheon Keynote Speaker, Bonnie Kee-Bowling, who delivered an inspiring message about how engineering has impacted her life. Gigabyte sponsors Northrop Grumman and Lockheed Martin also provided speakers for the professional panel discussions. Other sponsors included Baltimore Gas and Electric and Paradigm Solutions at the Megabyte level and RobsonWoese as a contributing sponsor. Scholarship sponsors include AFECA ? Women in Intelligence, Central Maryland, AFECA Bethesda, and Dr. Marilyn Berman Pollans. Over 50 students, professionals, faculty, staff and speakers volunteered their time to make this conference a success. We thank them for their passion and energy throughout the day.